Our lesson was meant to be at 9:30am today so I got up and had breakfast etc, to find the surf was so small it was actually called off. While the others watched a surf movie I managed to join in on another lesson, which went really well and I enjoyed. After the torrential rain, the sea went crystal clear yesterday to the same colour as Porthcawl over night. It's absolutely disgusting - all the sediment and debris has been washed out the creek, so we are having to make sure we wash really well in fresh water after a surf to get rid of the bacteria.. Probably due to the water colour there are heaps of bait fish right next to the beach and the turtles are about again. Everyone is just hoping it doesn't bring any bigger 'fish' in..
After lunch the rain was still going so a bunch of us watched 'Soul Surfer' which is a pretty good movie, but horribly Hollywood-ised. It was good watch after reading Bethany Hamilton's book as a kid anyway. After watching the film I managed to sort out all sorts of stuff on the Internet but borrowing a laptop e.g. Update the advertisement for my board on GumTree and put some more surfing photos of me on Facebook for home to see. After dinner it rained all evening again so we watched the films 'The Beach' which is pretty good, and the second American Pie as we are going through the whole series.. 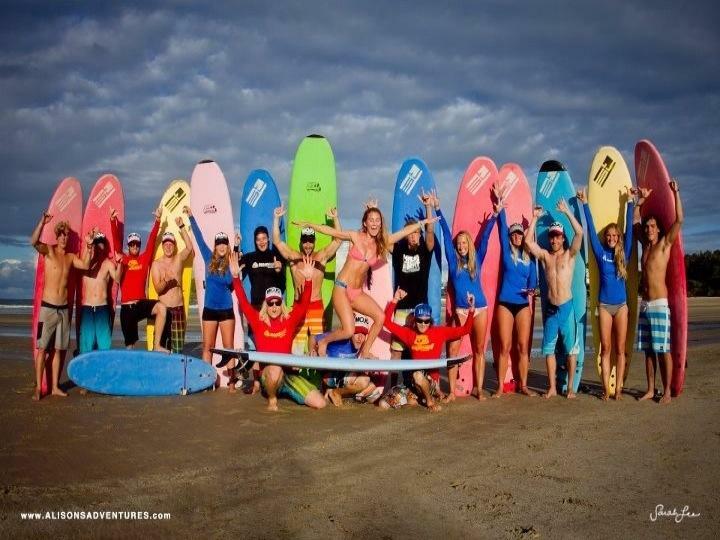 The surf is meant to be pretty rubbish again tomorrow and the weather not much better, so another uneventful but chilled day is probably in store..
(the photo is one of the promotional photos for Alison's Adventures which I am in on the right hard side, how cool is that! ).